We named one of our fresh flower arrangements "Sunset in Galloway" after the fair city of Galloway, Ohio. Flowerama delivers "Sunset in Galloway" along with all of our other flower arrangements every day of the week including Sunday. 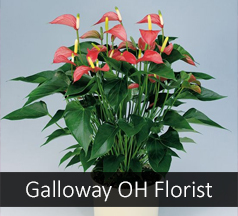 We offer same day flower delivery and same day express delivery to Galloway. Locally owned and operated with four retail flower shops, you can't go wrong when you select Flowerama as your florist of choice. We are good at what we do and try to get better every day. Even though we have won the Consumers Choice Award six straight years we won't be happy even when we get to seven. We also provide daily flower delivery to Galloway businesses, and Galloway nursing homes. Delivery to this area is $14.95.